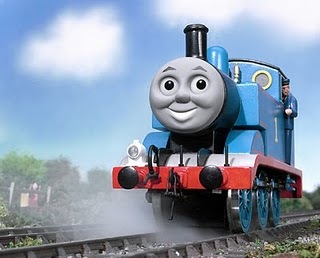 While watching a DVD of Thomas the Train with my Little Boy, I was dismayed to discover the movie lacked captions. So I took a photo of the TV screen with Thomas in mid-sentence, and posted the image on Facebook. My friends came up with some clever quotes, and I’ve selected my three favorites. Which one do you like? And the winner with the most votes in the Lipreading Mom Corny Caption Contest is…SHANNA SIKKES! Congratulations to Shanna and fellow contestants Tina O’Neal and Sharon Sala. Shanna will receive my autographed copy of Big Dreams, Small Spaces. Merry Christmas, everyone! I vote for #1, Shanna Sikkes. The captioned words were funny. I vote #1 Shanna Sikkes…funny. I vote for #2- she’s my mom! #1 – Shanna Sikkes – too funny! Shanna Sikkes all the way baby! I vote for Shanna Sikkes!!!!!!!! Hilarious! And the winner of the Lipreading Mom Corny Caption Contest is…SHANNA SIKKES! Congratulations to Shanna and fellow contestants Tina and Sharon. Shanna will receive my autographed copy of Big Dreams, Small Spaces. Merry Christmas, everyone!